Don’t worry if you’re brand new to the idea of making money online. You were, at one time, new to walking, reading, and speaking. There was a time you were new to the job you started. You learned all of that and you can learn how to make money online. The first step is to understand the basic idea of how many is made. Somebody or some company has a product or service to offer. They make money by selling the product or service to their customers. Pretty simple, really. Coffee companies make money by selling coffee. Travel companies make money by selling travel services such as booking, scheduling, etc… Restaurants make money by selling food and drinks. Entertainers make money by selling tickets and/or merchandise, performing in shows, and other endorsement options. Authors make money by writing and selling their books or articles. Realtors make money by listing and moving real estate. When money is being made, there is a buyer and a seller involved. If you want to make money, you need to be selling something. It can be something you created or something somebody else created. Affiliate marketers, sales people, and network marketers make money by selling products that somebody else creates. In my own case, I offer services. I provide email marketing tools that businesses use to generate leads, build relationships, and drive sales. I also provide advertising services to the network marketing and home based business market. I advertise my services online. I use classified ad sites, traffic exchanges, social media, etc.. and I talk to people I know that can use my services. I advertise something we call a “Capture Page”. A capture page isn’t designed to directly sell. It is used to capture someone’s attention enough that they want learn more. How do they learn more? They fill out a form that asks for their name and email address. When they fill out that form, they are added to my autoresponder that will automatically send my sales letters and follow up messages. Those messages include the reasons I think they should do business with me, how I can help them, and a link to my order/sales page. My initial focus is to generate leads. These are people who have expressed an interest in my offer by filling out my capture form. My next focus is to follow up with those leads to give them information and build rapport. My next focus is to help those prospects become customers. Does every prospect become a customer? Absolutely not! Some are just curious. Some are just not ready. Some are ready and they feel comfortable buying from me because they feel like they know and trust me. This same process can be used for virtually anybody that wants to make money online. 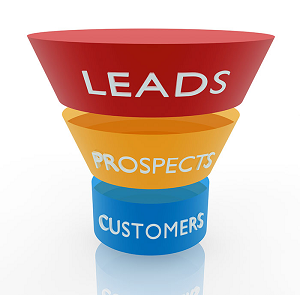 Convert those leads in to customers. All we are really doing is connecting buyers to stuff they want or need. When we do that well, we make money. When we connect them online, we make money online.